13 WISHES: It's a new school year at Monster High, and the little sister of Clawdeen Wolf, Howleen, is determined to be more fangtastic than ever. Her dream of popularity turns out to be easier than anyone imagined when she stumbles upon a genie named Gigi Grant who grants her not 3, but 13 Wishes! But the ghouls quickly learn to be s-careful what you wish for because each wish comes with a dark side, and soon the student disem-body of .. It's a new school year at Monster High, and the little sister of Clawdeen Wolf, Howleen, is determined to be more fangtastic than ever. Her dream of popularity turns out to be easier than anyone imagined when she stumbles upon a genie named Gigi Grant who grants her not 3, but 13 Wishes! But the ghouls quickly learn to be s-careful what you wish for because each wish comes with a dark side, and soon the student disem-body of Monster Hig..
Ghouls Rule: For years, students at Monster High were warned that Halloween was a night to stay inside and avoid conﬂict at all costs. But Frankie and her friends discover that ghouls and “Normies” once loved to spend that time together! The ghouls decide to turn back the clock and use the night to celebrate their individuality and show that it’s okay to “Be Yourself. Be Unique. Be a Monster!" Friday Night Frights & Why Do Ghouls Fall .. 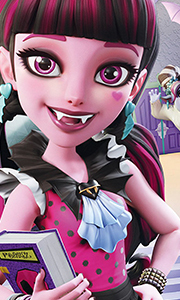 The Monster High ghouls are back in a freaky, fabulous double feature that's simply to-die-for! When the boys can't compete in the Skulltimate Roller Maze Championships, Frankie Stein convinces her friends that some "ghoul power" is needed to save the day in the creeptastic, all-new movie, Friday Night Frights. Then, as the epic Sweet 1600th of Draculara approaches, she's got two crush-worthy guys out to steal her heart (literally) befo..
Monster High: Ghouls Rule unearths an old conflict between "Normies" and monsters - and things are about to get scary! For years, students at Monster High were warned that Halloween was a night to stay inside and avoid conflict at all costs. But Frankie and her friends discover that ghouls and "Normies" once loved to spend the holiday together! The ghouls decide to turn back the clock and use the night to celebrate their individuality ..
Own Monster High - Girls Mug from Deff, DVD, Blu-Ray & 4K Video Specialists - Free UK Delivery..
Freaky Fusion: While attempting to help Frankie learn more about her freaky cool scaritage, the fashionably fierce ghoulfriends travel back in time to the first day ever of Monster High! There, they meet Sparky, a skullastic teen with an obsession for creating life. But when Sparky follows the ghouls through a killer time portal to modern-day Monster High, the event results in eight of them fusing together into four creeperiffic hybrid ..
Own Monster High - Electrified DVD from Deff, DVD, Blu-Ray & 4K Video Specialists - Free UK Delivery.. While attempting to help Frankie learn more about her freaky cool scaritage, the fashionably fierce ghoulfriends travel back in time to the first day ever of Monster High! There, they meet Sparky, a skullastic teen with an obsession for creating life. But when Sparky follows the ghouls through a killer time portal to modern-day Monster High, the event results in eight of them fusing together into four creeperiffic hybrid Monsters. Now, ..
Two more animated adventures at the school for ghouls. In 'Friday Night Frights' (2012), with their school having lost its spirit after losing in the annual roller derby tournament known as SKRM (Skultimate Roller Maze), the ghouls step forward to take on their arch enemies, the gargoyles of Granite City High. In 'Why Do Ghouls Fall in Love?' (2011), the ghouls have to work to bring back harmony when other monster schools are forced to .. When Draculaura is led to believe she’s the rightful heir to the vampire throne, she and her best ghoulfriends are whisked away to Transylvania for a royal coronation to die for. But they soon discover the hunt for the queen is not over yet. The Ghouls must locate an ancient artifact known as the Vampire’s Heart in order to discover the identity of the true Vampire Queen. It’s a fangtastic adventure that will lead them from the Tower of..
More animated adventures at the school for ghouls. When the ghouls get drawn into the school swimming pool which has been transformed into a portal, they find themselves transported to the Great Scarrier Reef and turned into mermaids! To enable the girls to return to reality, Lagoona (voice of Laura Bailey) must face her fears in the form of an old bully, win an underwater talent competition and defeat the evil Posea (Paula Rhodes), dau.. When Clawdeen Wolf gets the chance to apprentice for the legendary fashion designer Madame Ghostier, she and her best ghoul friends immediately pack their bags and hop on a plane to beautiful Scaris, France. As Clawdeen competes against two worthy opponents, Skelita Calaveras and Jinafire Long, her pals Frankie Stein and Rochelle Goyle uncover clues to a spooktacular secret hidden deep beneath the cobblestone streets. Join the ghouls fr..
Boo York, Boo York: Cleo de Nile is invited to attend a fancy gala celebrating the return of a magical comet and, of course, she brings along her beast friends. But their trip isn’t all fun and frightseeing because Nefera, Cleo’s sister, uses the comet’s powers for her own spooktacularly sneaky plans. Can the monsters unwrap the mystery of the comet in time to stop Nefera? Find out in Boo York, Boo York, the first-ever Monster High musi..